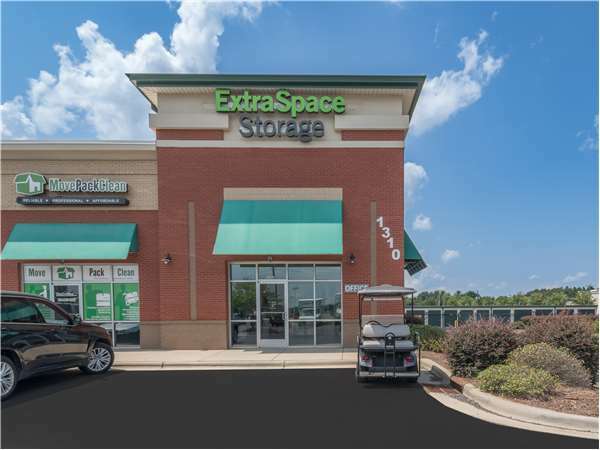 Located on Wesley Chapel Rd Ste A southwest of Old Monroe Rd, Extra Space Storage serves residents of Indian Trail, Lake Park, Wesley Chapel, Stallings, Weddington, and more. Locals will recognize our facility behind Express Tire & Oil Change across from Sun Valley High School. With a variety of storage units, climate-controlled storage, vehicle storage, and exceptional security, Extra Space Storage on Wesley Chapel Rd is the solution for you in Indian Trail! Our Wesley Chapel Rd storage facility has units ranging in size from 5x5 to 20x20 with features like indoor access, first-floor access, and drive-up access. We can accommodate storage needs of all sizes! At Extra Space Storage in Indian Trail, we're committed to the security of your stored belongings. That's why we've equipped our facility with 24-hour video surveillance and electronic gate access. Store your items with peace of mind at our Indian Trail storage facility in a climate-controlled unit! These units stay between 55 and 80 degrees year-round, preventing damage caused by extreme heat and cold. Looking for secure vehicle storage in Indian Creek? Extra Space Storage offers large outdoor parking spaces and enclosed drive-up units that can easily handle cars, motorcycles, boats, RVs, and more! We want to make it as convenient as possible for our commercial customers to run their businesses. That's why we have affordable office space for lease. Store inventory, materials, or equipment and operate your business from the same location. Contact our staff to learn more! With a clean, secure, well-maintained facility and a professional, friendly team, it's easy to see why customers trust the experts at Extra Space Storage. We provide reliable self storage with great service, and we work hard to ensure your needs are taken care of. Contact us today to reserve a storage unit in Indian Trail! Easy access and clean. Good price too. Amazed at the cleanliness and great location for us. Also the ceilings are extraordinary high on the climate controlled units. The staff was very helpful and followed up shortly after my call. It is a great value I think. Everyone very helpful. Facility clean. Easy access and times for entering units good. Security not a problem. Shopped around and so happy I chose this one. Not worried about my belongings. Would highly recommend this facility. The customer service and speediness of the process was beyond my expectations. My unit was very clean, the location is convenient and it very spacious and well kept. All in all I have no complaints so far. I have had the unit close to a month, at the present time I have no complaints. Highly recommend fr yur storage needs. Easy access and very clean. Excellent customer service! Courteous, helpful staff. clean, safe facility, great location. Reasonable prices. Paul has done a great job as new manager. Interior floors in my hallway has recently been sealed and waxed, looks good. I have an interior unit, Hall floors were recently waxed. Looks great. Paul has done a superior job as new manager. Excellent facility, staff extremely helpful and all paperwork was done quickly and efficiently. Clean, well kept storage facility. Comparable pricing. Drive southwest on Wesley Chapel Stouts Rd. Pass Old Monroe Rd and continue onto Wesley Chapel Rd. Turn right just after Express Tire & Oil Change. Our facility will be straight ahead. Drive northeast on Wesley Chapel Stouts Rd. Pass Sun Valley Middle School and continue northeast. Turn left just before Express Tire & Oil Change. Our facility will be straight ahead. Drive northwest on Old Charlotte Hwy. Turn left onto Wesley Chapel Rd. Turn right just after Express Tire & Oil Change. Our facility will be straight ahead. Drive southeast on Old Monroe Rd. Turn right onto Wesley Chapel Rd. Turn right just after Express Tire & Oil Change. Our facility will be straight ahead.